-- Hawker line details essentially done; generally 10-30 km/h faster than Bristol/Supermarine line. -- project expanded to entire United Kingdom in order to figure out where/how Gloster Meteor, De Havilland Vampire, etc. might fit into the bigger picture. -- Australia, Canada, India, etc. will be treated separately towards the end of the project. That is true, though CW-21 might show up in China due to the limited opportunities for progression there. Getting it steadily filled in... Good, good. I would like to note that the Defiant - while interesting, it really wouldn't have a place in this game with only a turret for armament. Interesting concept, but not good for a game based on dogfighting and without player control of the turret. Even historically, this proved to be a flawed concept for "fighter" design. Same goes for the Blackburn Roc, which was easily eclipsed by its cousin, the Skua. This is probably why the P.92 was ultimately cancelled as well. Edited by Raindrops, 31 July 2014 - 12:16 PM. -- The current heavy line is composed primarily of two-seat twin-engine aircraft and circumvents the Meteor by way of the Westland P.1056 and Gloster P.228 (a Meteor analogue). -- Preliminary work indicates that another heavy line composed of single-seat twin-engine fighters is possible from Tier IV to X (Gloster/Westland). -- It is possible to use the Gloster Meteor development in jet form as early as Tier VII (as indicated by Meteor Mk.I premium), and as late as Tier X (as indicated by engines evaluated on Meteor airframe). -- the decision to use Gloster Javelin as the Tier X in the current heavy line might suggest that the Meteor (or some form of it) is to be taken to Tier X, or that the line might transition to the English Electric Canberra (designer previously worked for Westland). Given the Meteor's use in a ground attack role it would not be unreasonable. 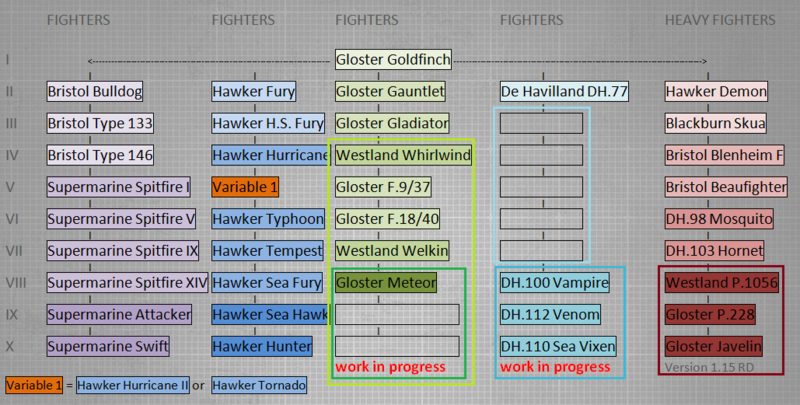 -- Vampire/Venom/Vixen were also circumnavigated, so the question is where they fit in relative to Meteor, and whether or not a line of development is possible or necessary leading up to them at Tier VIII, IX, X. 1) From an engine development point of view, the De Havilland jet engines (Goblin, Ghost) were developed by Frank Halford. Halford's career as an engine designer did not begin with jets, but rather began with De Havilland Gipsy, Gipsy Major, and continued with Napier & Sons in the development of Napier Rapier, Napier Dagger, Napier Sabre. The Sabre engine was most famously utilized in the Hawker Typhoon and Tempest, but Napier engines were also used by the De Havilland DH.77, the Martin-Baker MB.2, Martin Baker MB.3, and Blackburn Firebrand. (Martin-Baker MB.5 deviates by using a Rolls-Royce Griffon but it is a remarkable aircraft without a home if omitted on that point alone). 2) From the carrier-based-strike-fighter point-of-view, the line becomes more flexible about what it can include, but then it becomes very difficult to provide a "uniform feel" to the line. This method might include Fairey/Blackburn fighters and/or light bombers. -- If Vampire/Venom/Vixen are instead added as a minor branch, then it would make the most sense (in my opinion) as a minor branch coming from Hawker Tempest (based on the Napier engines also designed by Halford). Cool Jellyfish! I don't know if an upgraded Venom would be tier X though cause the Vixen seems outside the scope of the game. Plus it had two engines so that would maybe put it back in HF ranking, but maybe it could work cause wikipedia said initally it had cannons. It would look cool as heck though. I say WG nerf it a little so that it fits into tier X as a fighter!!! My thoughts is that the Gloster HF line would start from the Beaufighter, and do an either/or split at the P.1056 and the Meteor, both linking back up to the P.228. The Hornet would have the choice of going to the P.1056 or to the Vampire to finish the Dehavilland line. They could add the earlier fighters/heavy fighters later. I say they add these planes soon!!! I really want them! More than the Hurricanes to be honest. Edited by S01836775, 11 August 2014 - 06:33 PM. Hopefully after all the work you've done the devs decide to make these lines! I agree with S02985y0974260847265 that having the DH Vampire come off the Hornet would probably require the least amount of work to get rolling on. Perhaps have the Typhoon and Hurricane come off of one of the existing lines too as a branch off to get them going soon - with the Typhoon possibly operating in a GA role? -- The goal is to track technological advancement with precision to see how that might be reflected in the tech tree beyond simple placement at each tier. -- These details are not revealed through specifications but rather through close reading and cross-referencing of development narratives. Blackburn Skua (02/1937) -- (Janes 1938, 23c) -- "fin and rudder ahead of the tail plane." Edited by J311yfish, 30 December 2017 - 01:40 AM. J3llyfish, i just read all your stuff on the Hawker line, but I'm still trying to figure out how they would fly in game? My guess is really low altitude, great firepower, weak HP's, average manuverabilty pretty much everywhere, slow optimal airspeeds but good rate of climb. What are you thinking though? J3llyfish, i just read all your stuff on the Hawker line, but I'm still trying to figure out how they would fly in game? I don't have the information to substantiate a proper summary, and I don't like to guess, but I think it is fair to say that their strength relative to Bristol/Supermarine will be speed/climb. The information above substantiates that. I don't know what their weakness might be but I would be surprised to find it show up as lower durability or lower altitude. If altitude band is informed by engines, then I would expect that tiers I-IV and IX-X might be consistent with other British aircraft in-game. For the larger Napier engines it might be appropriate to look sideways to the Americans for a benchmark. The carrier-borne aircraft might have lower stall speeds (as would be desirable for landing on a carrier) but I can't substantiate that other than to say that it is logical. Overall I would expect it to be a very strong line with no glaring weakness. Multirole implications for United Kingdom? ^ that would certainly allow them to work around the Hawker Tier III problem while keeping Gloster intact. Fairey/Blackburn might in there prior to De Havilland, will revisit eventually. Tying Hawker in there is a nice observation. The Typhoon was used as a ground pounder as well as the Hunter (it's a fighter-bomber k?). Geh, I was going to do a "multi-role in 1.6 and the implications thereof" thread, but you kinda beat me to it for the most part. ...Eh, since there is still room for German/Russian discussion, I'll do it anyways - but I'll probably be stealing your British/Japanese comments anyways. Hmm. the addition of the Fantome as a tier IV prem kinda throws a wrench in the Fairey part of the Dehavilland line :(. Well not necessarily. It might depend on how Vampire/Venom/Vixen are classified. If they are considered to be multirole then you may see Fairey Swordfish, Barracuda, Spearfish, etc. and maybe Blackburn to fill gaps if any. It has been months since I have looked at it in detail but I remember being stymied trying to make progression clean. That and being unable to find any information to justify the current heavy line made me decide that they can and will do anything they want with the British line. I have not been able to find any reasonable explanation for Vampire/Venom and Meteor to be circumvented in favor of P.1056 and P.228, for example. Anyway, that's why this project is halted indefinitely. You have always done great work and these threads. I have enjoyed watching you work through each tree with your idea's. True. The brit HF tree has always puzzled me. It's not the most logical progression. The Dehavillands would have made sense, but they aren't HF's, and Meteors would have made sense if they added the Javelin as an alternate tier X. I have no idea why the P.1056 is even on the tree, although I like it in the game. But that would be cool then if they did the Swordfish family as the early tech tree path. I guess I didn't think about them being multirole and not fighters. Fantome — Increased manoeuvrability and speed characteristics, increased HP and weapons damage. Ilyushin IL-10M — Chinese Tier VIII Attack Aircraft. Edited by J311yfish, 06 May 2015 - 08:46 PM. Fantome? As in, Fairy Fantome? I honestly was unaware we had that in the game, but I did come across this. Polish designers participate in development of the Vampire, Venom, and Vixen for United Kingdom -- could this help to explain the missing De Havilland jets?